Der er nu åbent for ansøgninger til den internationale sommermesse Goldsmiths North for smykker og moderne sølvkorpus, der afholdes i det grandiose The Cutler’s Hall i Sheffield 12.-14. juli 2019. Der er stand/disk og lys til rådighed for alle deltagere, og det koster £895 at deltage. Sheffield has a worldwide reputation for fine metalwork. The presence of one of the four Assay Offices in the UK makes it a centre for national precious metal production. Historically known as the home of the UK’s steel making industry it is also respected and well known throughout the world for its high-quality cutlery and silversmithing. 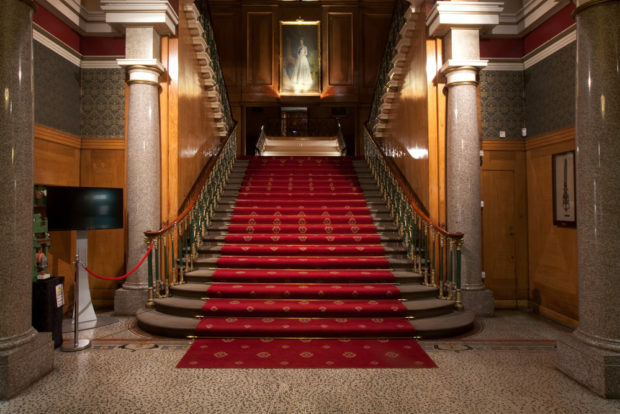 The Cutlers’ Hall is without question a magnificent venue steeped in history and grandeur and is regarded as the finest livery hall in the north of England. It will provide a new and specifically tailored selling platform to skilled and innovative creative businesses within the precious metals sector. It will be a national/international event – a retail selling fair bringing the best of designer jewellery and silversmithing from the UK and Europe to the north of England. Goldsmiths North intends to showcase the work of approximately 60 individual designers and craftsmen. Applications to exhibit will be invited from both jewellers and silversmiths and a jury of local and national experts will be convened to select the best and most professional work. It is intended that those chosen will be representative of the best work currently being designed and made across the UK. In addition it is intended that up to 20% of the exhibitors will be from outside the UK, providing an opportunity for exhibitors and visitors alike to see as wide a range of work as possible. Exhibitors will be professional designers and/or craftsmen. They will be required to be present at their stand during the Fair’s opening hours, creating a ‘meet the maker’ environment for the visitors. Søg inden udgangen af 2018. Læs mere om ansøgning mm.